Who doesn’t love some roasted chicken once in a while? Here’s my recipe for lemon pepper chicken with thyme… Crazy easy to make, absolutely delicious, and as tender as rotisserie. Serves 2-4 depending on appetite & size of chicken. 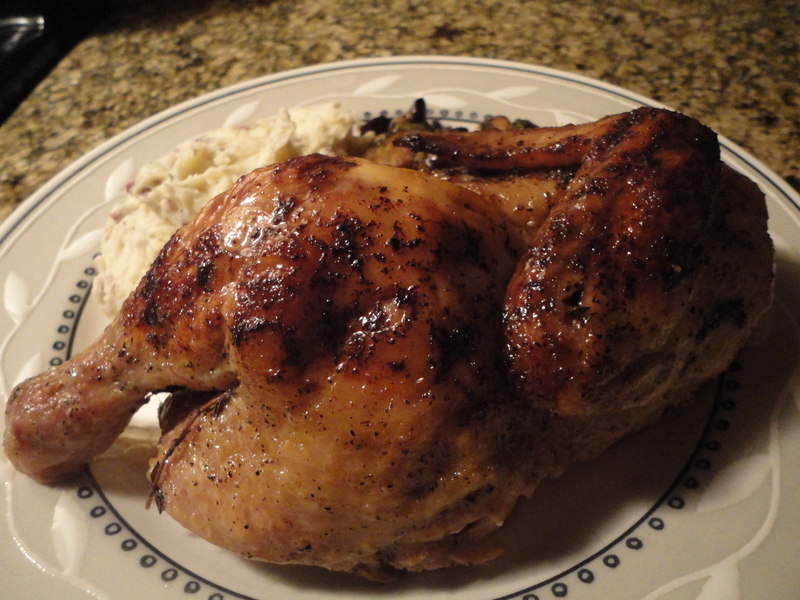 I’m a big fan of buying small chickens (or larger Cornish hens) and cutting them in half length-wise prior to cooking. I do this for two reasons. First, because when serving two people (me and the wifey) it’s easier to just place the entire half on a plate rather than carving (I loathe, LOATHE, carving). Secondly, I feel that it leaves me with a more moist end product. I will be giving the directions using this method. If you want to keep the chicken whole then simply don’t cut it in half and don’t worry about searing it off before roasting. Trust me though, doing it my way you get some seriously tender chicken breasts… absolutely no knives necessary! Also, I prefer using an oven safe sauté pan with a cover when making this dish. It saves dishes and time. If you don’t have a large skillet or oven safe sauté pan simply transfer the chicken to a baking dish or dutch oven once seared off (assuming you’re cutting it in half). Heat the olive oil in a large oven safe sauté pan or skillet at medium-high. Coat the cut side of the chicken with 1tsp of salt and 1tsp of pepper (combined, not 1tsp of each for both halves). Place the chicken cut side down in the sauté pan and sear until browned. The reason for doing this is to help retain juices in the chicken while roasting. In a bowl combine the melted butter, lemon juice, salt, pepper and garlic powder. Brush the unseared skin side of the chicken with a 1/4 of the lemon butter mixture and add the sprigs of fresh time to the pan. Cover the sauté pan and then place it in the oven for 45 minutes, brushing with more lemon butter at 15 minute intervals, using an additional 1/4 each time. After 45 minutes increase the oven temperature to 425F. Uncover and cook for an additional 50 minutes, brushing the chicken with the juices from the bottom of the pan every 10 minutes. Allow to rest at least 5 minutes at room temperature before serving… And that’s it. Simple, delicious, tender, fall off the bone lemon pepper chicken. Serve it with your favorite side and have at it. Personally I did some whipped red bliss potatoes with butter, ricotta and thyme, as well as roasted sprouts and ‘shrooms. Do whatever you want, go crazy! Tags: chicken, chicken on the bone, comfort food, cooking, lemon pepper chicken, perfect pairings, perfect pairings at home, roast, whole chicken. Bookmark the permalink.